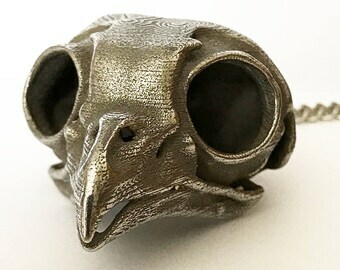 3D Printed Skull transforms CT Scans of real animal skulls into jewelry and beautiful skull decor. Each of my sculptures is in effect a “memento mori” or remembrance of the death of the individual and of the species. Being mindful of death is of course a way to celebrate life, both of the individual and the species. The technique of making the pendants uses a traditional lost wax process, but with the advent of 3D printing, we can now make extremely delicate and scientifically accurate models of a skull from a CT scan (just like the kind used in a hospital). Once the model is created from the scan, it can be 3D printed in wax. This wax model is then embedded in plaster, the wax is melted out and pure molten bronze, silver or gold can be poured into the mold. It is somewhat less expensive to make a silicone mold from one of the wax prints and use that to make additional wax models. For the items that are particularly popular, we make silicone molds. These pendants look great as bracelet charms. Ever since I was I child, I have been fascinated by bones. As I walk in the woods, I am constantly on the lookout for a skull or a skeleton and the story it can tell. Bones are the remains of a living creature that best withstand the elements and can be preserved for millions of years as fossils. Each of my sculptures is in effect a “memento mori” or remembrance of the death of the individual and of the species. Being mindful of death is of course a way to celebrate life, both of the individual and the species. With my training as a medical doctor, I utilize the same CT scanning technology that we use in a hospital for our patients. Once a skull is scanned, I use radiology software weave the many 2D slices into a virtual 3-dimensional model which can be modified with 3D modeling software to create a design that can be 3D printed and molded. These exciting new technologies are then combined with the ancient art of lost wax casting, dating back over 5000 years. Please feel free to contact me with any questions you may have about my products. I can even create custom models based on your own CT scans. The human skulls shown in my shop were made from a CT scan of my head. International Manufacturing, is a small family-owned company established in 1989. They have a reputation for providing local jewelers with personalized casting services, and employ only about a dozen people of diverse ethnic backgrounds. Shapeways.com describes themselves as follows: "Shapeways is the leading 3D printing marketplace and community, empowering designers to bring amazing products to life. "